At 7 am we gathered our gear, rubbed our sleepy eyes, and walked out the door of our apartment at Villa Los Mangles (read our hotel review here). The owner, Antoine, was waiting for us and we walked together down to the beach. The sun was already bright. It would be another hot, muggy August day in Isla Holbox, Mexico. 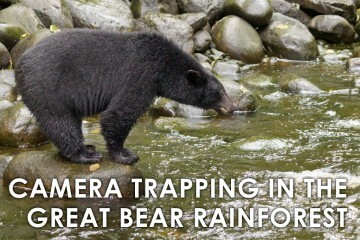 Within minutes, a smallish boat approached. It was painted a cheery sea-foam green, just a few shades lighter than the deep emerald green waters of the Gulf of Mexico that kept it afloat. 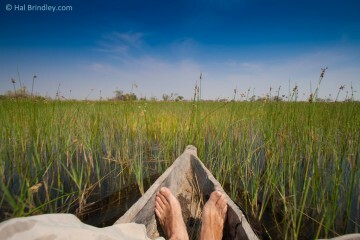 The boat motored across the shallow water and landed at our feet. It contained our captain Pedro and our guide Ruben from Turistica Moguel. These two men were taking us to swim side-by-side with the largest shark in the world. Cristina and I climbed aboard along with Antoine and another couple. Altogether there were seven of us on board. I could see another tour boat loading just up the beach with at least twelve passengers trudging across the water. I was glad that we were taking the “private tour” which costs only slightly more than the standard. It would also give us the chance to spend more time in the water, which I was eager to do. 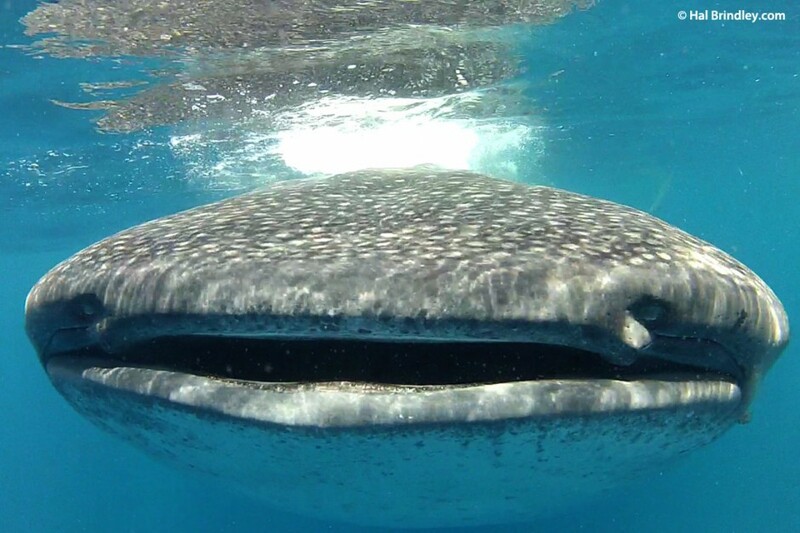 After all, this is the whole reason we came to Mexico in the first place, to swim with the Whale Sharks of the Yucatan Peninsula. Beachfront pickup by Turistica Moguel. Ruben briefly explained our itinerary and the rules of swimming with whale sharks. 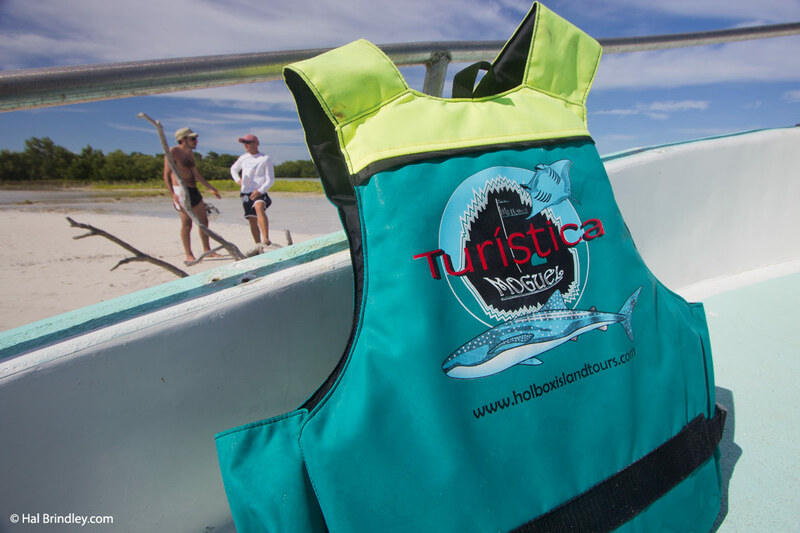 The Holbox whale shark tour community maintains impressive standards for interacting with wild creatures, all designed to minimize the impact of tourism on this amazing natural phenomenon. For example, only two swimmers are allowed in the water with a shark and always with a guide. Swimmers must wear a life jacket or wetsuit in order to remain buoyant and not dive beneath the sharks. And most important of all, we must stay at least 2 meters away from the sharks. However, I would soon learn that sharks don’t always stay 2 meters away from you. Swimmers must wear a lifejacket or wetsuit when swimming with whale sharks. We launched the boat and began the long journey to the “Azul” (blue). There are two main aggregations of whale sharks along the top of the Yucatan. The first, discovered in 2002, is the Cabo Catoche aggregation. Here, sharks feed in the green plankton-rich waters of the Gulf of Mexico. Scientists have reported seeing up to 145 individuals at once. 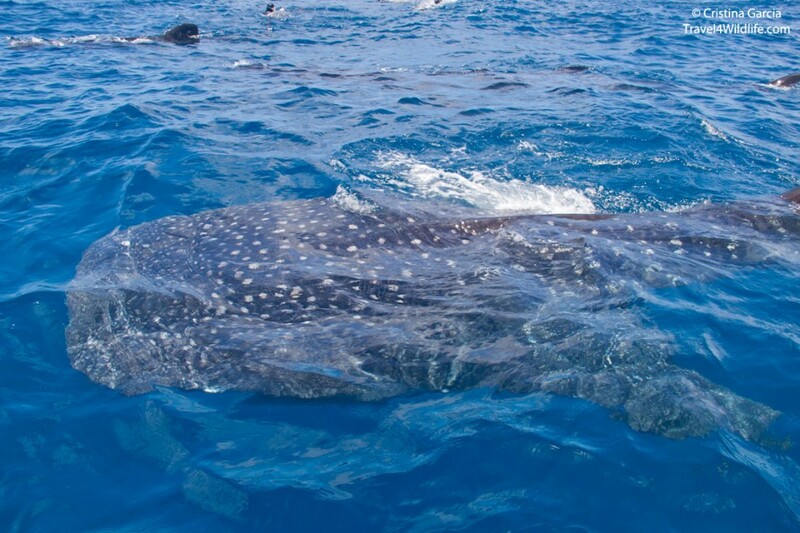 It is upon this grouping, easily accessed from Holbox, that the Holbox whale shark industry was born. Then, in 2006, a second major feeding site was discovered farther off shore, directly east of Isla Contoy. This group, named the “Afuera” (outside) aggregation, was feeding in the clear blue waters of the Caribbean upon fish eggs. Hence, locals began calling it the Azul (blue). As scientists began taking counts, they discovered numbers that blew even Cabo Catoche out of the water. In August 2009, a world record 420 individuals were sighted feeding at once. 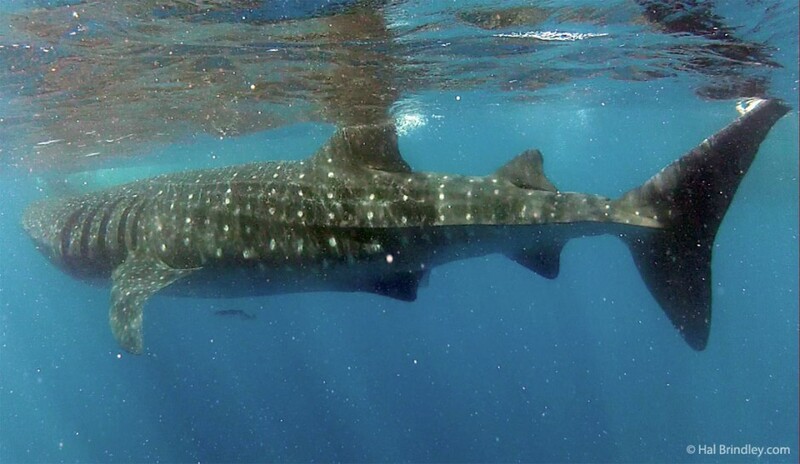 This cements the Yucatan Peninsula’s reputation as the number one place in the world to see whale sharks. This year, 2012, shark numbers were lower in the Cabo Catoche group so our tour guide decided we would be traveling to the Azul. 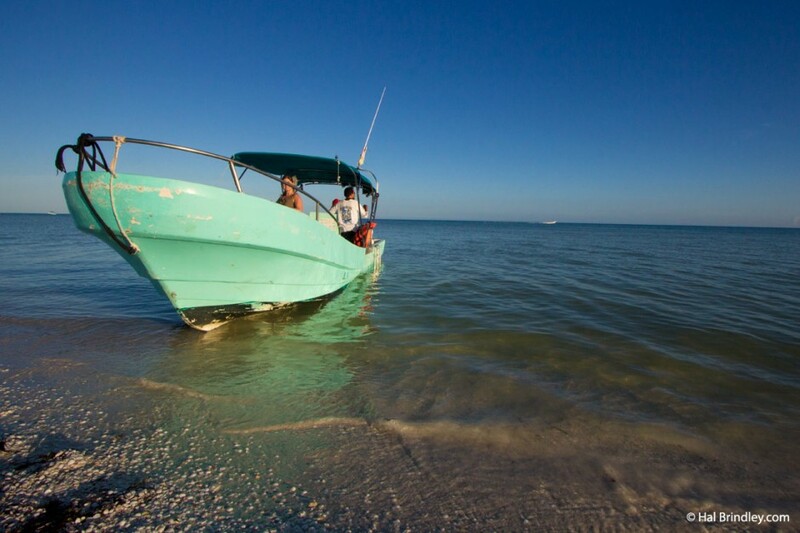 Unfortunately, the ride to the Azul is a bit longer for Holbox operators. So our ride this morning would last over two hours, sometimes through bone-jarring chop. Whale Sharks in every direction. At least seven are visible in this photo. We passed Isla Contoy and soon saw what looked like a floating city. As we approached, we realized we were looking at a tight grouping of tour boats. I counted 53, circling in an area less than a kilometer across. Antoine exclaimed that he had never seen so many boats at once. Perhaps it was because it was a Saturday. Perhaps it was the fact that the ports had been closed the past four days because of hurricane Ernesto. Perhaps its because each year, more and more permits are being issued to Isla Mujeres operators which have a closer reach to the Azul. Whatever the case, we were a bit shocked by what we saw. And though there were plenty of huge black fins cutting the top of the waves, we were thankful that our guide Ruben decided to take us further out where a less crowded grouping could be found. Fifteen minutes later, we arrived at another grouping of boats, perhaps 15, and got our first close look at a whale shark. Woah. That guy is big. About as big as our boat. And there’s another one. And another one. They are everywhere, slowly circling with their rounded black fins cutting the surface and the pointed tip of their tall tails lazily waving back and forth behind. Then one approaches close enough to see a head. 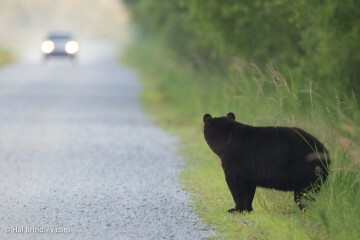 It as wide as the hood of a Buick, dark gray covered with a delicate grid of white polka dots. Time to get in the water. The shark instantly fills my vision. It stretches to both ends of my peripheral view, the head all the way to the left and the tail all the way to the right. It slowly swims past us, undulating its tail back and forth. When the tail fin finally reaches us it is taller than I am and sharply pointed at the top. I realize I’ve been holding my breath and slowly release it into my snorkel. Ruben looks at us and waves us on. There are plenty more sharks to see. Here comes another. The behemoth is coming straight toward me. 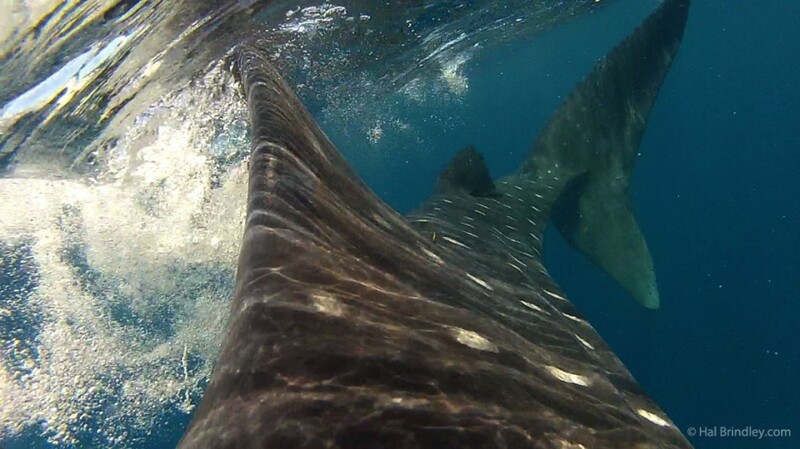 That’s when I see it for the first time, the famous whale shark mouth. The grill of the Buick suddenly opens up from side to side. The entire front end of the creature is mouth. Looking into the abyss of its gaping maw I can see the shark expanding in volume as hundreds of gallons of water pump through its giant gills. Uh… it’s not turning. I imagine myself getting sucked headfirst into that pale white cavern and decide I better move over. After a few jerky kicks of my flippers, the shark is now heading slightly to my left and I breathe a tiny sigh of relief into my snorkel. The head is getting wider and clearer as it approaches and I catch my first glimpse of the shark’s eye. He looks straight at me then decides to modify his direction. Directly toward me. Whale Shark coming straight at me. There is no time to move. The mouth fills my vision then suddenly closes. The shark dives beneath me but only by inches. I am laying flat on the surface of the ocean as the world’s biggest fish gives me a detailed tour of its generous anatomy. The wide flat head soon gives way to a more rounded back, crested by a dorsal fin several feet tall, which is rapidly approaching. I try to dodge it to the right. Suddenly the shark raises itself like a surfacing submarine and I am lifted straight out of the water. That is when I discover what whale shark skin feels like. Like other sharks, its skin is covered with tiny “teeth” called dermal denticles. It is rough, but not exactly like sandpaper because it has direction. More like a stubbly beard made of microscopic needles. It felt like a million tiny pin pricks along my body. Perhaps the shark felt me bonk against his back because he immediately sank again. The smaller second dorsal fin passed under me and the swishing tail loomed rapidly toward me. Like the tail fin on a jumbo jet, this vertical blade is rigid and narrow and extremely tall. It swayed back and forth like an executioner’s blade and I couldn’t predict where it might strike me. Again I dodged right but the cartilaginous ridge struck me across the forearm, it felt stiff like a piece of wood, but thankfully the leading edge is rounded and it merely glanced off me. I looked back and it continued on its path as though it had merely ducked under a piece of floating driftwood. Over the course of an hour we swam with dozens of sharks, sometimes we were surrounded by them. They would form little trains, or feed side by side, or intersect at random angles. 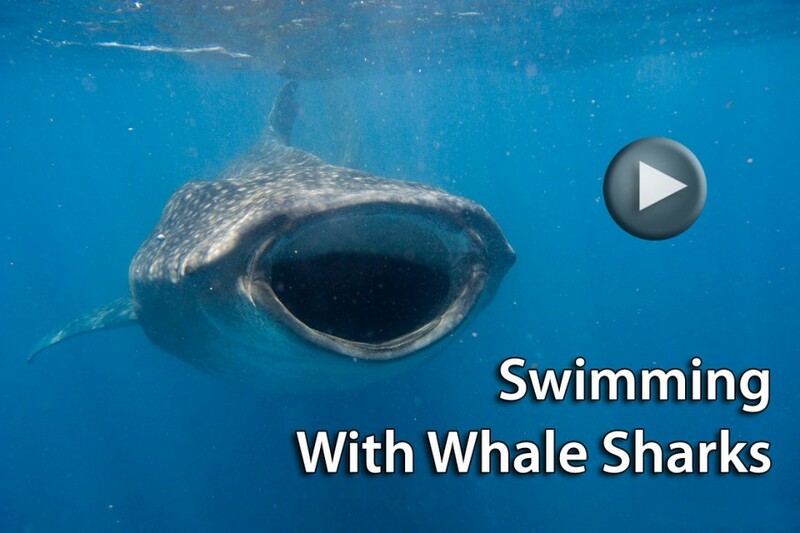 Cristina once found herself in a whale shark sandwich, both were swimming toward her and closing in when a third approached in the middle, which she managed to dodge. The sharks cruised slowly at the surface, vacuuming up massive volumes of water along with millions of transparent fish eggs. Occasionally one would dive but only a meter or two below the surface. We saw one in a resting position, floating head up at the surface with its 25-foot body dangling downward into the deep blue water. 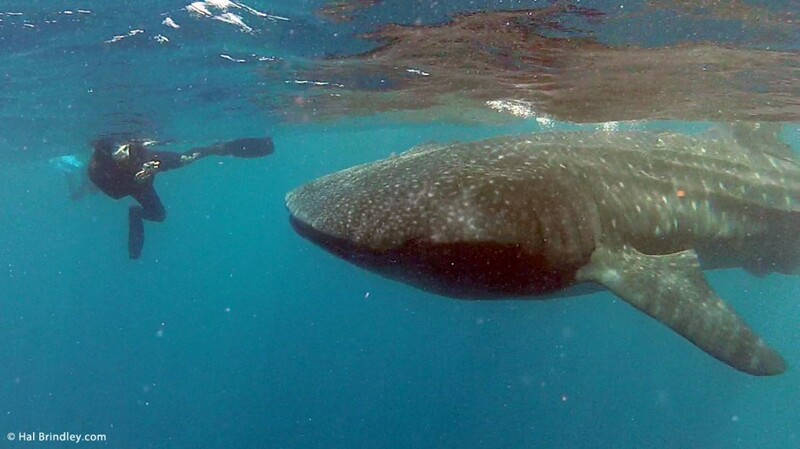 A snorkeler photographing a huge whale shark. “Are you ready to go back to the boat?” our guide asked us. I felt like I could stay out all day as our hour had passed in what seemed like ten minutes. But the other two were already back on the boat and feeling a little sick. So I reluctantly pulled off my flippers and climbed back up the ladder. 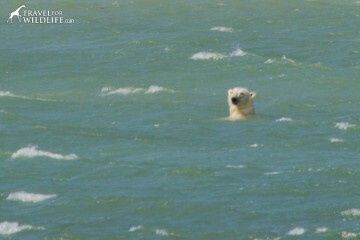 We watched from the surface a little while longer before making our way back toward Holbox. Along the way we stopped to catch lunch. 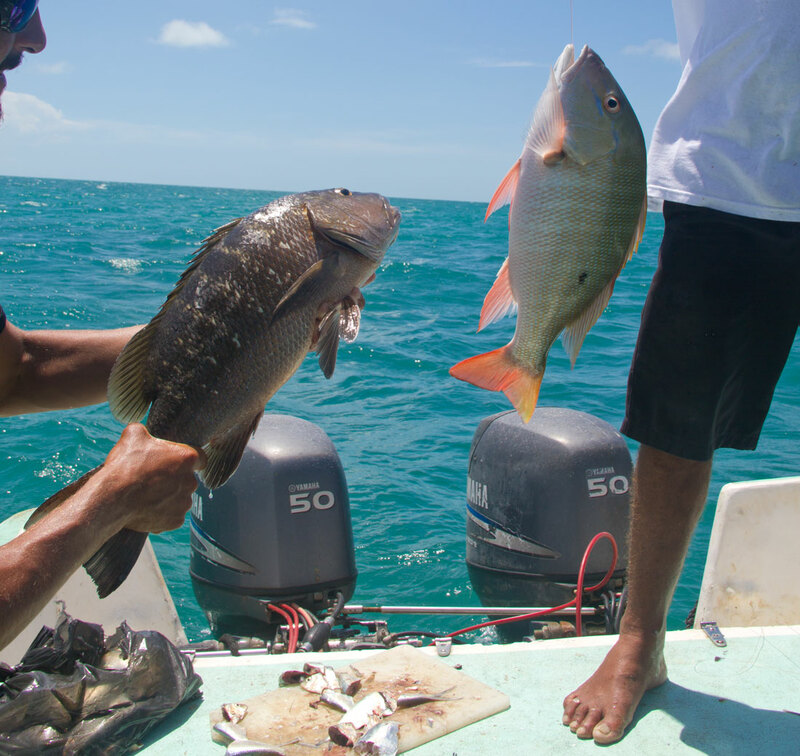 Pedro and Ruben handed out spools of heavy fishing line with a sinker and a hook, baited with a slice of fish. Within minutes they had pulled aboard at least five large fish. As for me, my bait was devoured three times in a row without catching a single one. I was fine with feeding the fish and not the other way around. I couldn’t help but think what a waste of money it was to buy a fancy fishing rod was when these guys were catching ten-pounders in thirty seconds flat with nothing but a hand-held piece of fishing line. We drove the boat into a protected inlet where our hosts prepared ceviche: a cold salad of tomato, onion, cilantro and raw fish in lime juice. It was the freshest fish I ever tasted. We devoured it greedily with totopos (corn chips) while the pelicans and magnificent frigatebirds soared overhead waiting for handouts of discarded fish parts. 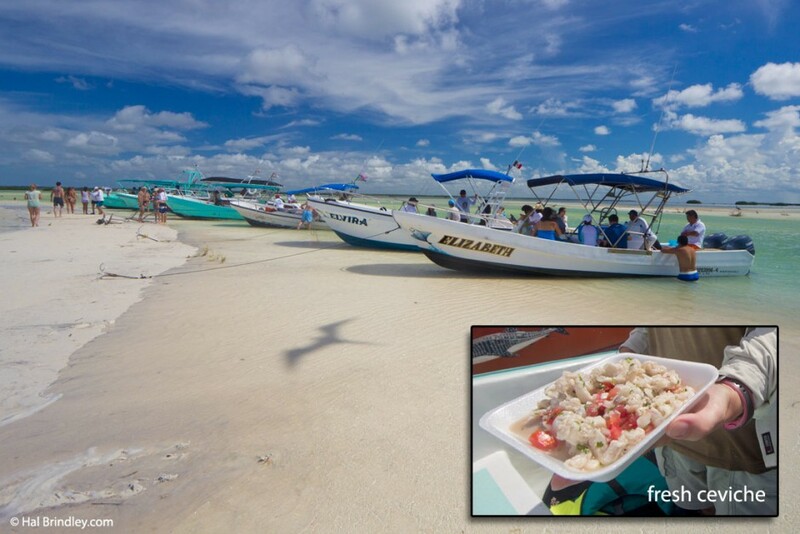 Whale Shark tour boats park for lunch in the river and eat fresh ceviche while a Magnificent Frigatebird cruises overhead. When we landed back at our beach, nearly ten hours had passed. We were sunburned and tired and full-bellied and sore as we wandered back to our apartment, but I was still smiling happily. Next ArticleCreature Gallery in Asheville is Open! Definitely much better in the wild. We went to Isla Holbox and we loved it. There are no cars, it is a very chilled out little place. If you want to go we have done two lodging reviews. You can choose, hotel or apartment. I loved Isla Holbox. After that you can go and swim with wild turtles just south of Cancun. It is really a trip of a lifetime.